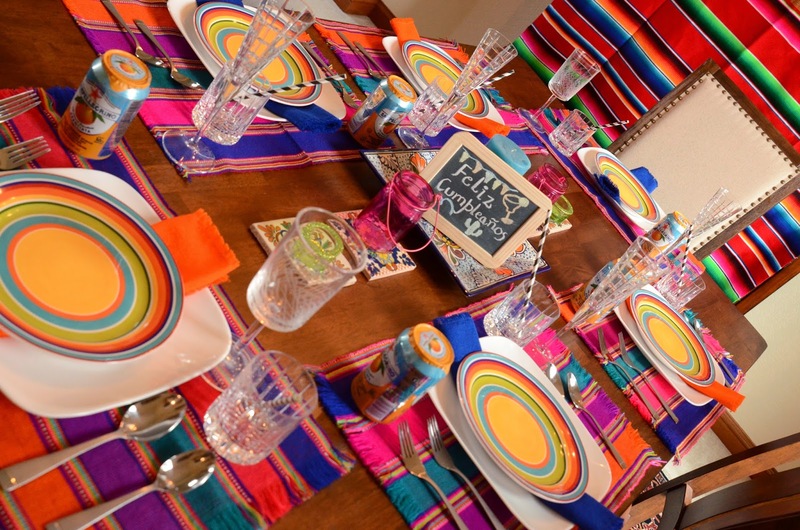 My fiesta table comes to life in vibrant colors! 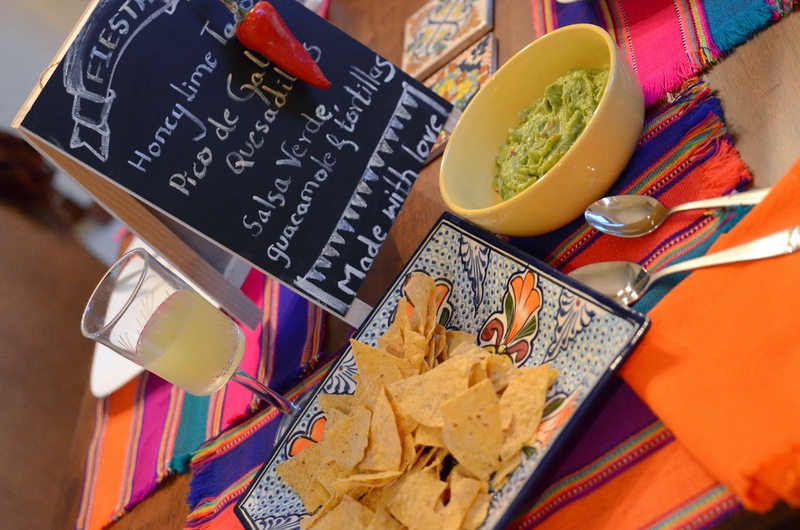 Today we are back with The Tale of two dinners - this time a feisty Mexican Fiesta - that's right! 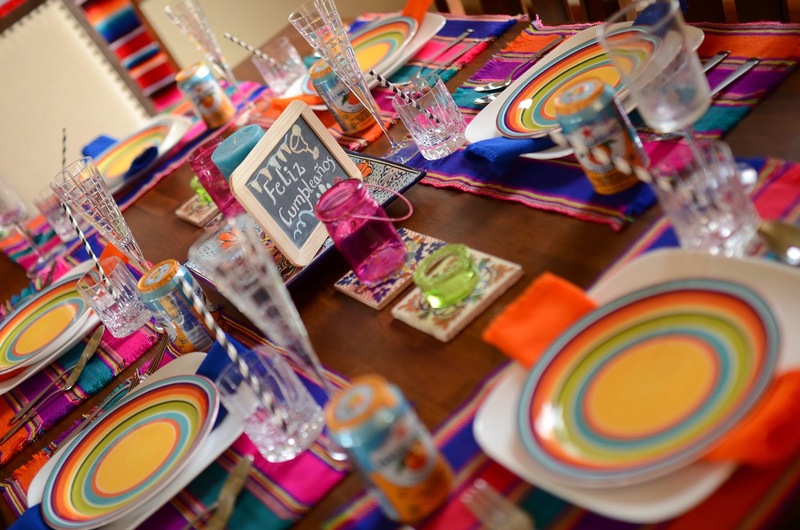 Join me as I tell you the story of this colorful intimate dinner that I hosted a few days ago. But first, join me in wishing Supriya a very Happy Birthday! Happy birthday Supriya - stay inspired and stay blessed! April is her birthday month and so is my husband's! My husband turned 40 earlier in the month and of course, this called for a celebration! He asked for a quiet observance at home! But I knew that a congruous spree to honor his kind hearted, chivalrous, generous, hard working and fun loving spirit would take creativity and planning! And of course, I always have high expectations of myself and this being his 40th, I had to step it up a few notches. For somebody that is always open to the idea of new possibilities - a weekend getaway to mark the milestone birthday seemed perfect. However, work and logistical difficulties made it impossible to go anywhere that weekend. And so, we decided on a quiet wingding at home with a home baked cake! 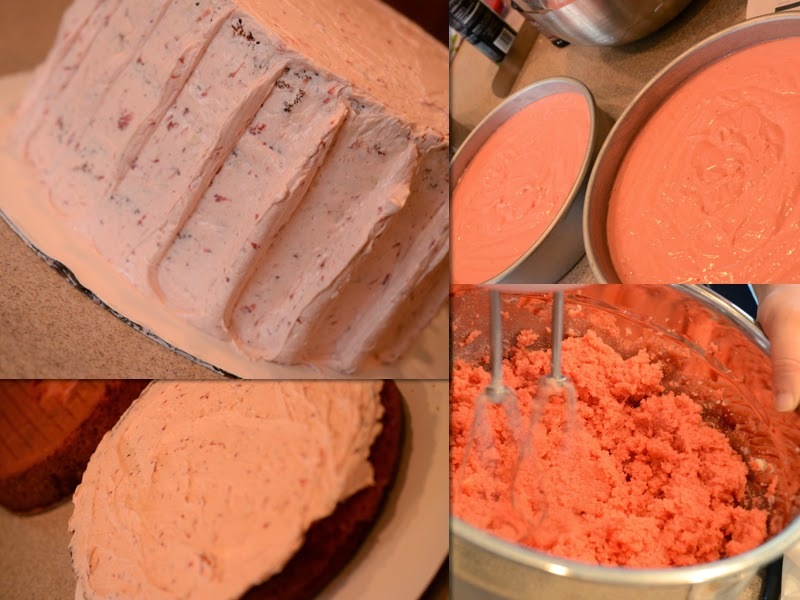 Yes, wait till you see pictures of the ambrosial three layered, from- scratch strawberry cake that I baked! Anyway, a fiesta felt like a seemly tribute to his charismatic personality - confident, positive and full of life! Viva la Mexico! 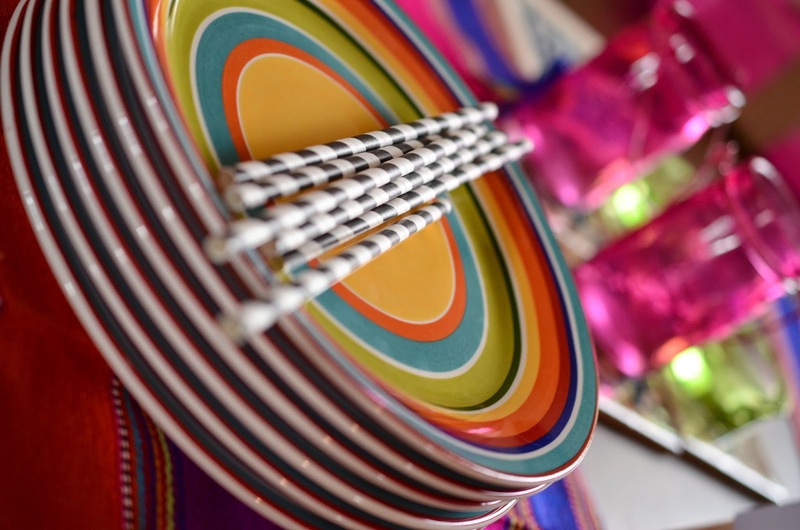 Our fiesta had many details - vibrant colors, delectable mexican food and spanish sign boards. The only thing that was missing was a live Mariachi band! My husband takes pride in his looks and sense of style. Timeless style appeals to him and he leads a stylish existence. He is truly 40 and Caliente! This quickly became the theme! I was challenged at first with all the little ideas in my head but slowly but surely it all came together and I was thrilled with the end result. My li'l one's personal tribute to dad's 40th! 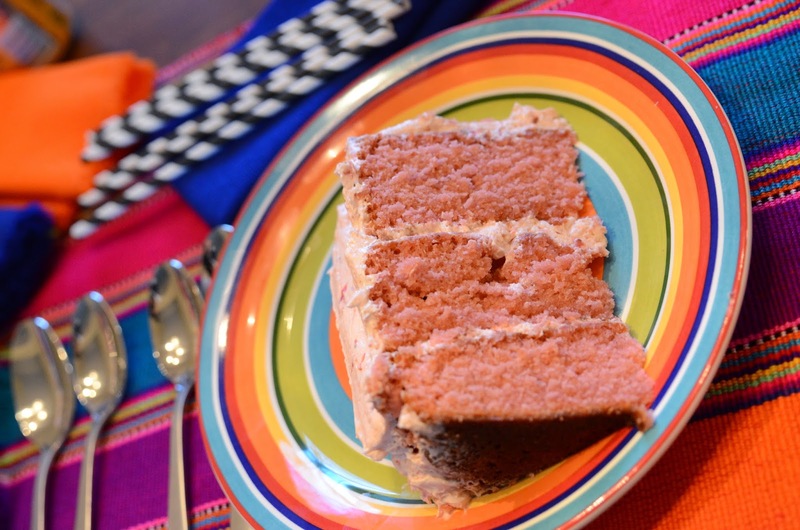 Table setting: I chose Guatamelan striped place mats, fiesta salad plates and a gorgeous Talavera plate from Pueblo for the centerpiece - I was not worried about the color overdose at all - it was entirely intentional! Decor: I wanted to retain the theme and yet keep it classy. I decided not to do any tacky b'day banners. 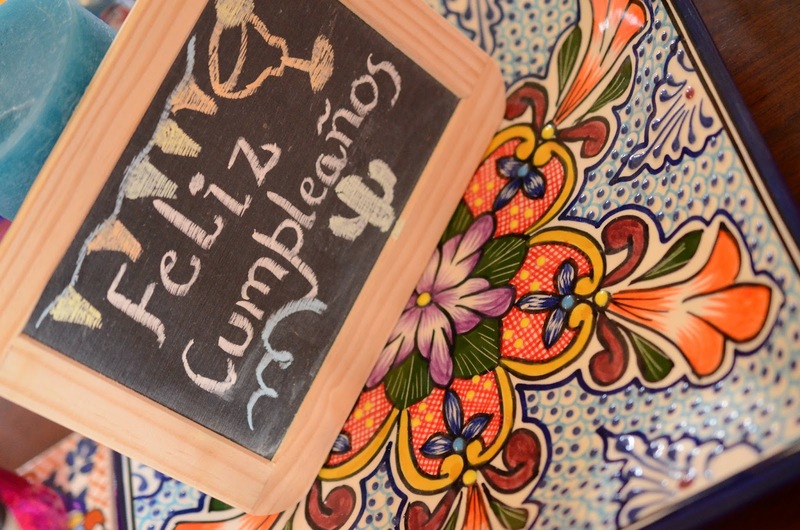 I used chalk boards and spanish signs for an elegant twist! 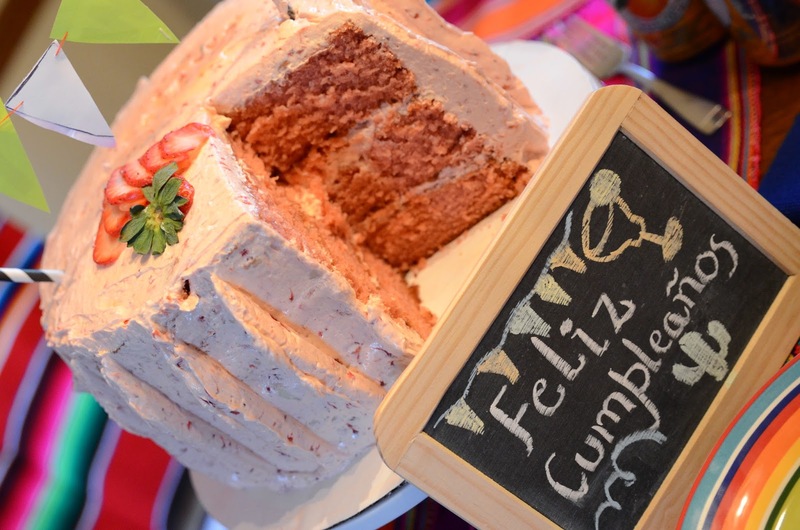 Feliz Cumpleanos! Give your cakes personality with a cake banner! 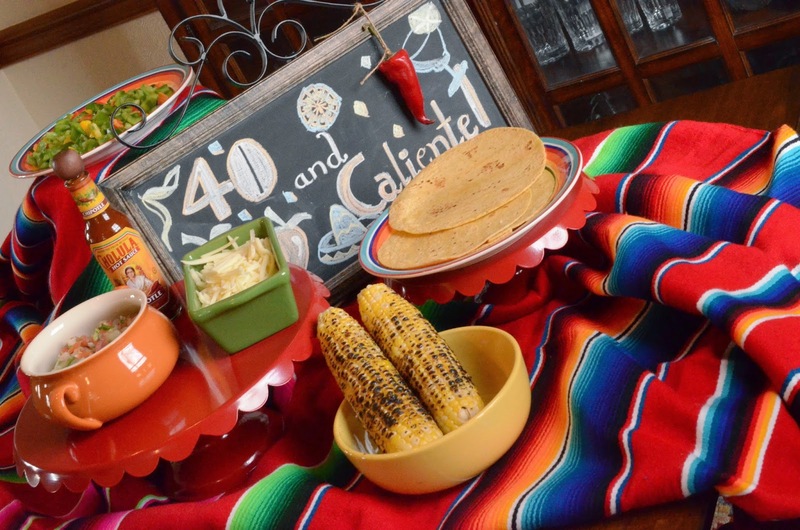 Food : We whipped up a few easy dishes in our cantina - honey lime sweet potato and black bean tacos, veggie quesadillas, pico de gallo and some yummy guacamole! 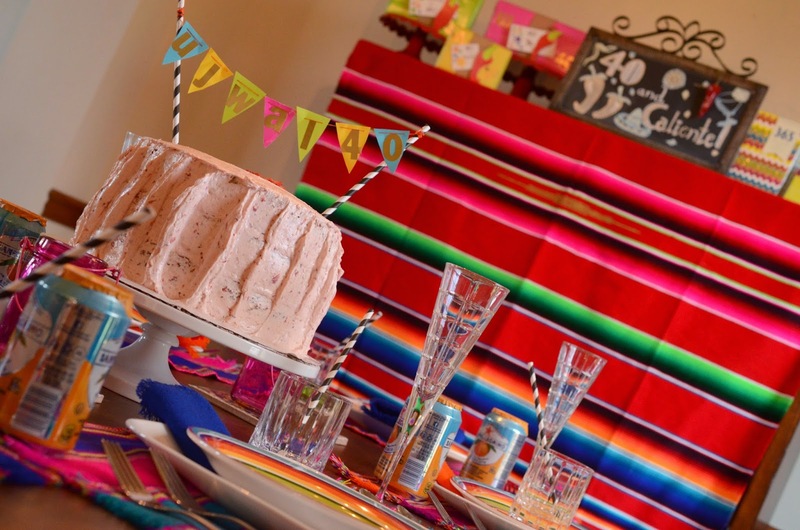 Personal touches: We custom made a fiesta banner for the cake (well, there was a hidden agenda behind this. I am a novice baker and icing is not really my forte and so, a cake banner was an easy alternative to announce his age!). The banner was made from two striped straws (love 'em!) 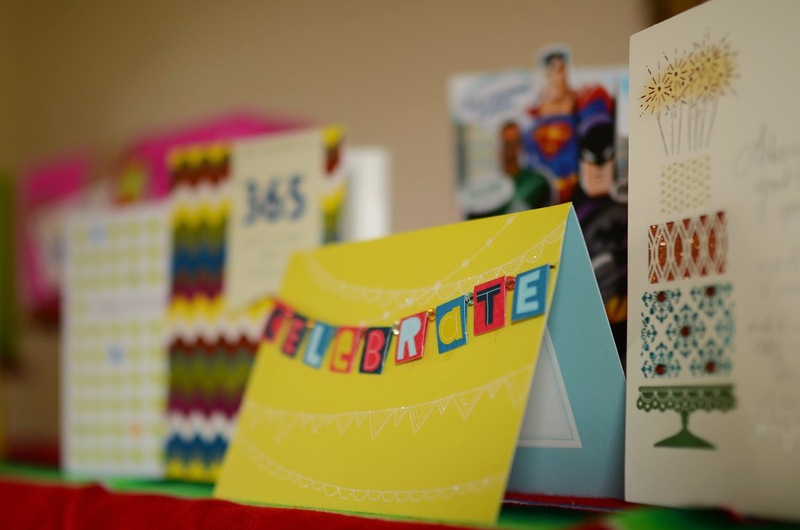 and some scrap paper - DIY crafts are a great way to get kids into the party spirit. 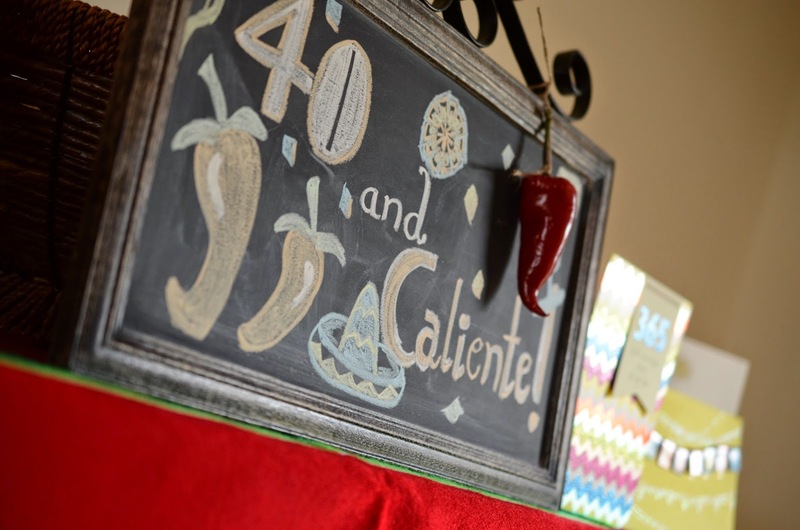 I also personalized the gift wrap with some fun signs and and red pepper shaped cut outs to incorporate the Caliente theme - who says 40 year olds can't have fun! Cake: Now, this was undoubtedly the best part of the day. I believe in meaningful celebrations and baking the cake made it a very personal and intimate experience for our family. some butter, some cream but dollops and dollops of love - Happy b'day hon! I fondly remembered bonding over a box of strawberries on our first date many years ago and therefore came up with the idea for a strawberry cake. There was no way I could've managed baking an entire cake on my own given my limited baking skills and so, my dear husband lovingly volunteered to help and what a romantic afternoon it turned out to be too! It was all about learning a new skill and making some fond memories together and it was perfect - the afternoon and the cake! My husband's passion for life is something I inspire for. 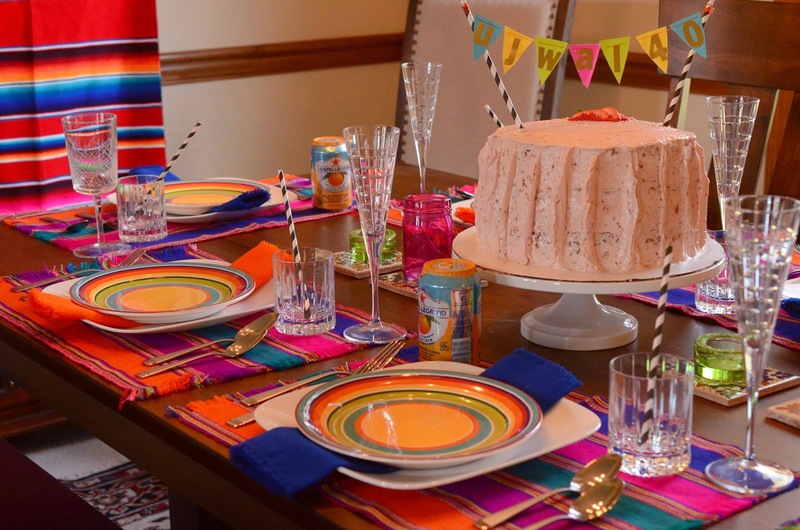 This colorful fiesta celebration reflects his mojo, positive energy and great attitude. 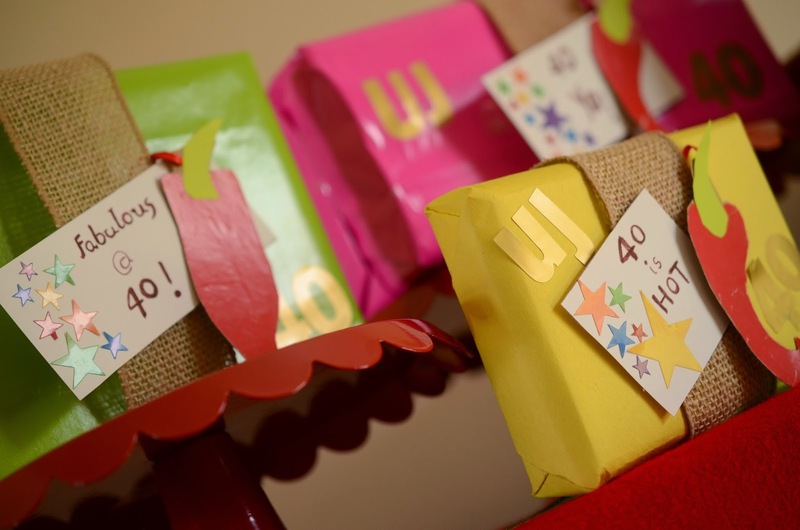 He is always a joy to be around and this fun filled fiesta was perfect for his 40th! Mile stone birthdays are also a time for reflection - a time to look back and a time to look forward. I just added a little color and culture to it, that's all. And there you have it dear readers - my rendition of a Mexican Fiesta! Whether you want to try making chimichangas or thai pineapple curry for your next dinner party - I hope we've inspired you through our tale of two dinners incorporating world cuisine. With a little planning and imagination you can bring global cuisine right to your kitchen and serve it up in style! And I will be back with my last post for the month of April in a few- stay tuned! P.S: All images are from my home and taken by my husband and copyrighted to Aalayam. Please do not use without permission. Wow! I love the color explosion. So festive. Thanks for paying us a visit Priyam. Supriya and i love welcoming new readers. Please join the Aalayam and let us inspire you. Yes, you will soon realize that both Supriya and I have a thing for color. When tastefully used, color can surely brighten one's day dont you think? Vikash : we are glad you are here. Please join the Aalayam family! 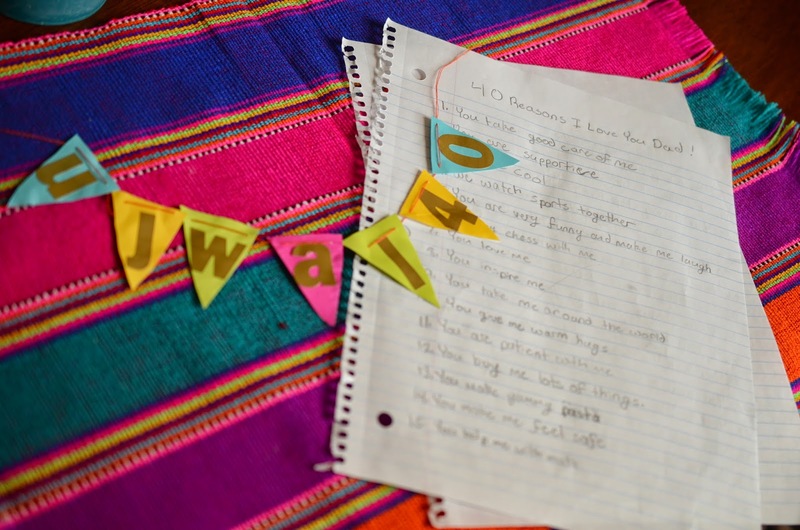 Wow, color overdose or not, it has so many personalized gifts like your daughter's list of 40, that it must have been a super special celebration for the bday boy. Beautifully organized! Thank you Ambika. And you are right, this celebration had many personal stamps on it which I am sure we as a family will recall fondly many years from now. must have been a super celebration isnt it deepa?colours so matched..where did you find these props/..you bought all of them? It was a LOT of fun!! I bought the place mats and the mexican blanket on a recent trip, the stripe fiesta plates were from a local store - other than that not much buying really - i had the silverware the glasses, the chalkboard and gift wrapping paper(which I used to make the cake banner)... so, really this tablescape was accesorized with several things I already had. thank you for taking the time to comment lakshmi! Wow Deepa...you always thought of every little detail. It looks super fun, love the chalk board idea and riot of colors. Thank you Nayana and welcome back to blogging! Prathibha, Absolutely. This was a great recipe and my boss at work ( a baking maestro!) walked me through it step by step and it turned out great. Give me a few and I'll send it across to your email. She also shared some excellent tips for a novice baker like me which I found very helpful - your expertise may be different though..